Ski, gold, hike, bike, canoe all in one the day? Local folks brag that one can get all that in at Whistler Blackcomb Ski Resort, so we needed to do some fact checking. 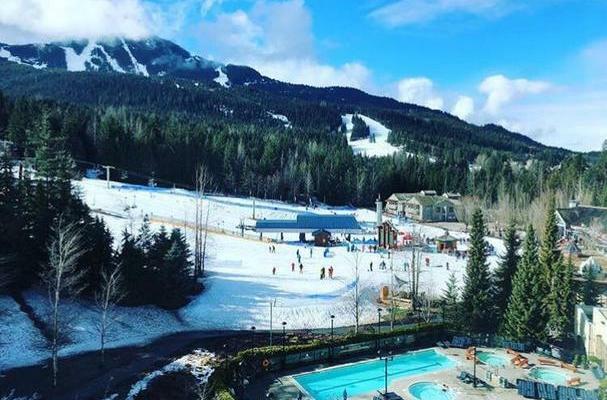 The ski resort is nestled between Whistler Mountain (1530 meters-5020 feet) and Blackcomb Mountain (2183 meters-7160 feet) so it easy to find snow on the upper mountains, even in May (especially on Blackcomb.) 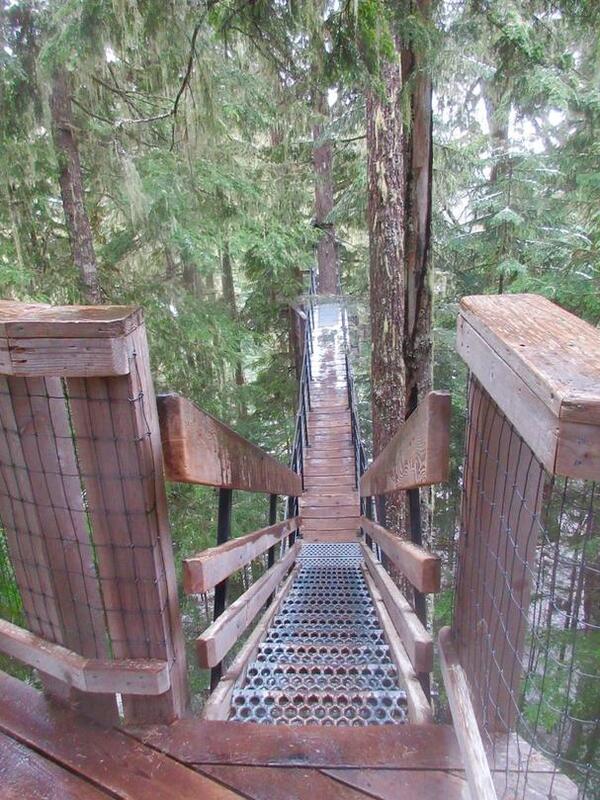 It is located just a little over an hour and a half drive from Vancouver, BC and four hours from Seattle. The resort is legendary for its downhill skiing terrain, boasting over 1520 meters (5000 feet) of runs, so you can easily achieve a vertical workout on each of the mountains. For us Nordic skiers there are over 160 kilometers (100 miles) of trails, in addition to the Whistler Olympic Park at Callaghan Valley. Our fact-checking started at the Fairmont Chateau Whistler which was home during our visit. The view of the gondola from our room confirmed that we could easily ski in and out from the hotel and then enjoy the heated indoor/outdoor pool later. For golf, there is less than a ten-minute walk to the Fairmont Chateau Golf Club. If one wanted (not suggesting) an early start, you can tee off at 6 am and be done in four hours. That leaves you plenty of time to return to the hotel, get your ski gear, and head to Blackcomb. 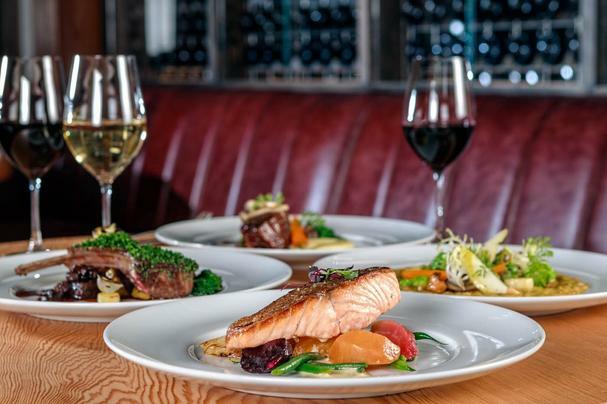 If our calculations are correct, that’s four hours of golf and two hours of skiing, which would certainly earn lunch at the Portobello located in the Fairmont complex. The delicious (and large) turkey sandwich and West Coast Chowder really hit the spot so we grabbed another sandwich to go for an active afternoon. Later in the spring and summer, the slopes are quickly converted to a world-class mountain biking mecca. Earlier in the spring, I did a guided snowshoe trip with The Adventure Group which followed the mountain bike route named “Crank It Up.” I knew that I did NOT want to bike as this is best left to the experienced mountain biker. However, I noticed the mellower bike ride on the Scenic Valley Tour. The ride goes around Lost, Green and Alta Lakes on “Comfort Bikes.” I was all in for both mellow and comfort! Done for the day? No! We have had about ten hours so far of activity but remember that from the middle of May to the beginning of August we have over 15.5 hours of daylight. Since lots of energy had been spent today, a shorter hike (4.5km- just less than 3 miles) of the Crater Rim Trail was perfect. 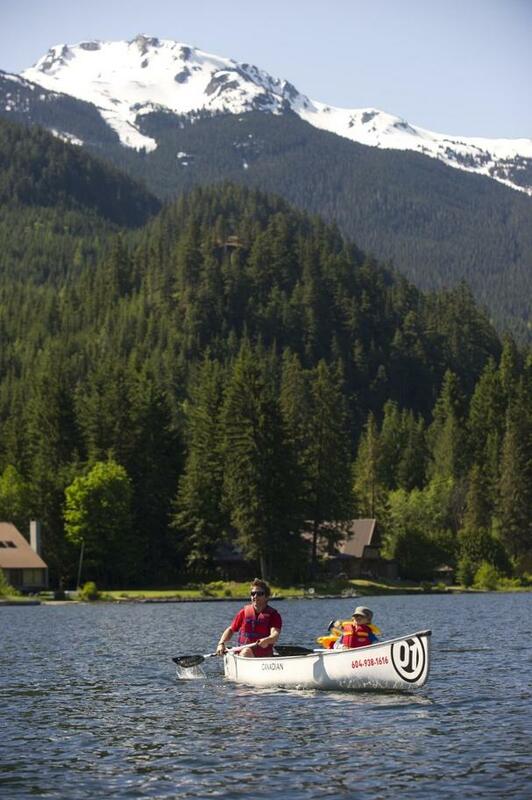 Canadian Wilderness Adventures offers a three hour Alta Lake tour by canoe. Although we did not get to this on our trip, we did enjoy a half day in the mountains with their guided snowmobile tours. One would think that one would use much more energy paddling than sitting on a snowmobile. Not so, a snowmobile ride requires lots of energy, movement, and balance to help steer. However, one can cover much more of the mountain scenery in several hours than just using human power. 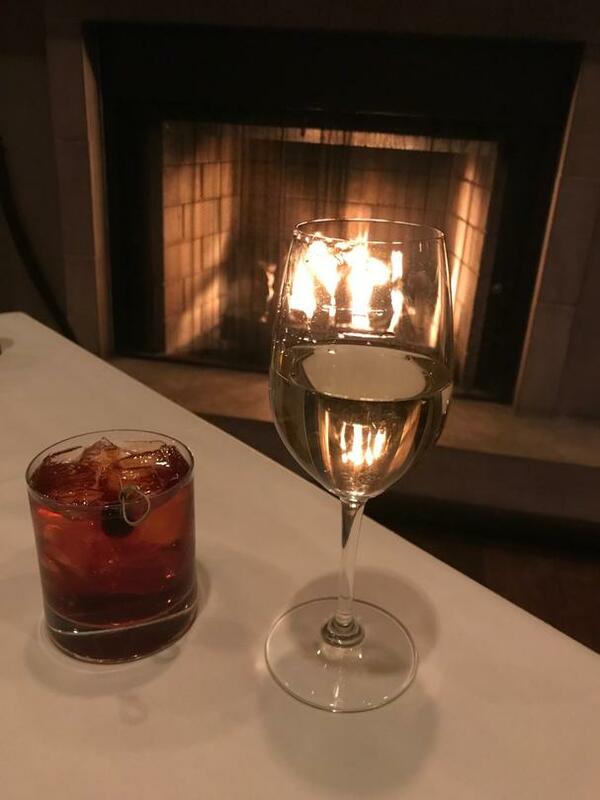 After an active day like this one, we were undoubtedly ready to return to the Fairmont, take a quick shower and head downstairs for dinner at The Grill Room. This was the crown jewel of the day! 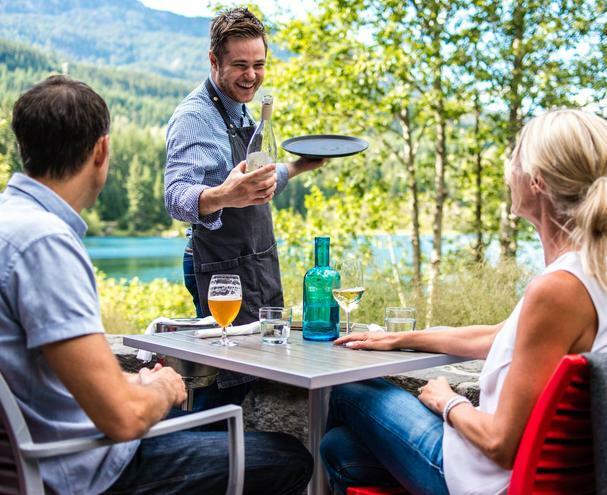 The Grill Room was awarded “Best Whistler Restaurant” by an esteemed panel of culinary experts in Annual Vancouver Magazine Restaurant. We agree!! 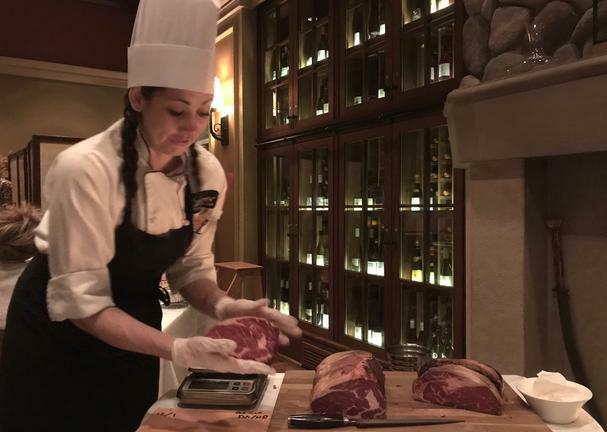 Executive Chef Isabel Chung deserves high praise! She honed her culinary skills as a child in Singapore while helping her parents in the kitchen. She brought these skills to Calgary where she landed her first culinary job. She started at the Fairmont in 2005 and worked her way up the ladder. Now it was time to taste her offerings. 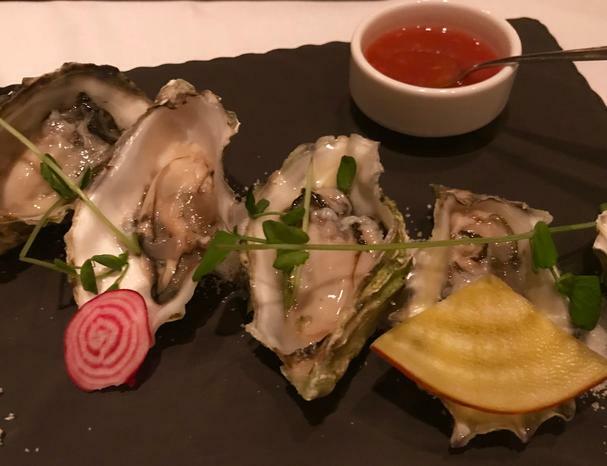 We started with the famous Fanny Bay Oysters. Fanny Bay is the pristine waters off the east coast of Vancouver Island. Firm meat with a mellow taste with a touch of horseradish awakened my taste buds. The second oyster dipped in a pickled relish, cilantro, and spiced tomato sauce. The tastes slowly and gently danced in my mouth. 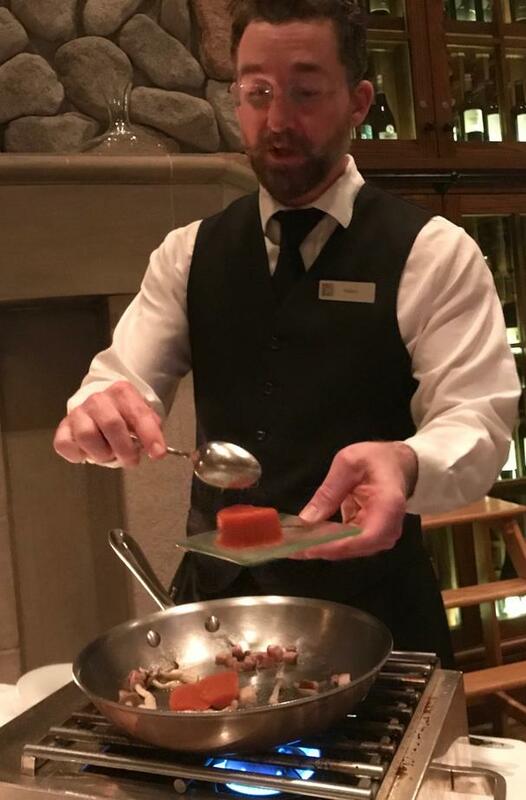 My wife was interested in some dramatic table-side presentation, so she ordered the Flambéed Tomato Gin Soup. The server tossed the fresh ingredients of mushrooms, tomatoes, house smoked bacon together and then added and the showcase ingredient, Schramm Organic Gin, and lit it up. The huge burst of flame caused oohs and aahs throughout the restaurant. After her first taste, my wife said: “I’m going to dream about this soup.” Not sure if it was the gin, but I suggested that we take the 30-minute drive to the north tomorrow to the Pemberton Distillery for a tasting. For dinner, I stayed local and went with the Pemberton Meadows Dry Aged Rib Eye. 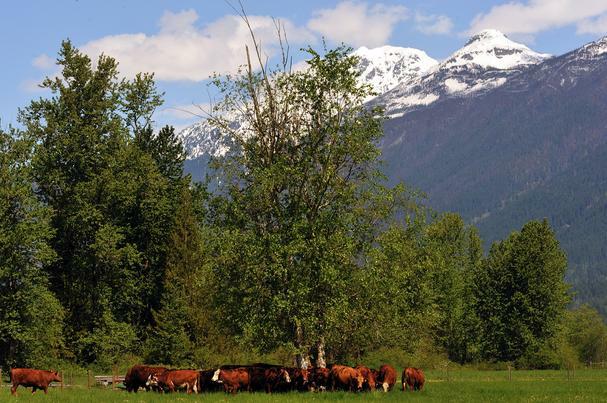 The old cliché rang true: this beef was definitely from a “happy cow.” These happy cows roam in fields overlooking the mountains and have a gourmet diet. The farm is meticulous to the extent of growing the food to feed the cows. I guess gourmet hay creates gourmet meat! One bite of this tender, juicy steak and I was quickly one happy human. My wife had the Rack of Lamb which was swoon-inducingly tender and delicious - so very little of that was shared with me. However, all was forgiven when we shared the Double Chocolate and Salted Caramel Sundae. These brownies bites with caramel sauce were delightful and surprising light. We slowly made it up to bed and planned a much different day for tomorrow, with a slower and more relaxed pace. Our plan was for a mellow day with no rushing, so we split up to divide and conquer some of what Whistler has to offer. I would walk near the treetops while my wife would head to the spa, and then enjoy the art museum. Scandinave Spa is located a short distance from Whistler Village. Along with body treatments such as Swedish, restorative, prenatal, and deep tissue message, the hydrotherapy pools make this a unique spa experience. The Scandinavian tradition of hydrotherapy involves a repeating cycle of hot, cold and relaxing temperatures. First stop is the hot pools. You can choose from a Eucalyptus Steam Bath, Wood Burning Sauna, Finnish Sauna or hot pools. The next stage involves the cold, exhilarating Nordic Waterfalls, Nordic Showers, or Cold Plunge Baths. Then on to the Relaxation areas – Solariums, Hammock Haven (summer only), Outdoor Fireplaces, or the Yoga Studio. The pools, saunas, and showers are located outside – with the grandeur of nature all around. It is open year-round, and even in the cold months, it is an invigorating and relaxing experience that would be difficult to find anywhere else. Meanwhile, back in the treetops, Ziptrek Ecotours took our group on an awesome hike over a network of suspension bridges, boardwalks, trails and treetop lookouts. While walking among these giant trees, we chatted about the rainforest. Although they only cover about 2% of the earth’s total surface area (7% of land surface), they host more than 50% of world’s animals and plants. The largest rainforest is the Amazon jungle and is home to 1/5 of all the world’s plants and birds. How big? It is the size of the contiguous United States! 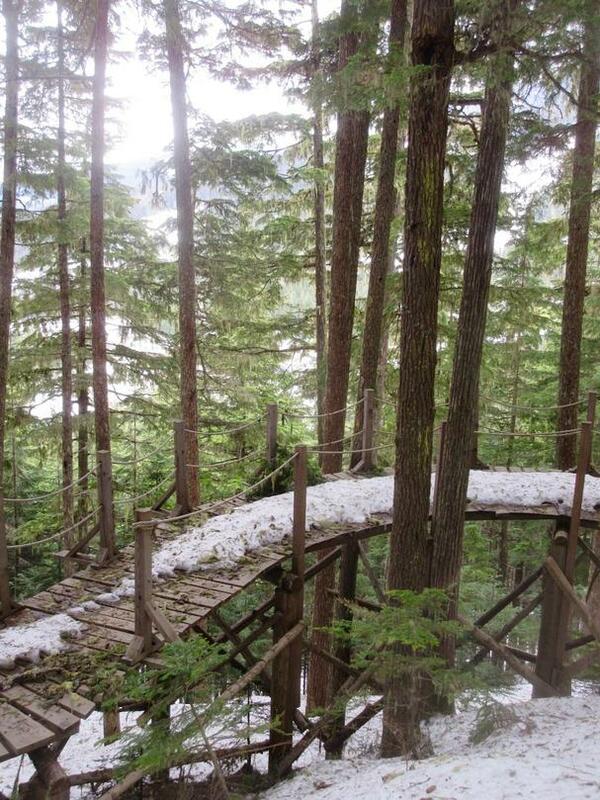 How big is this rainforest at Whistler? It is part of the Pacific Temperate Rainforest Ecoregion of North America and extends along the Pacific coast north from Northern California all the way to Prince William Sound in Alaska. 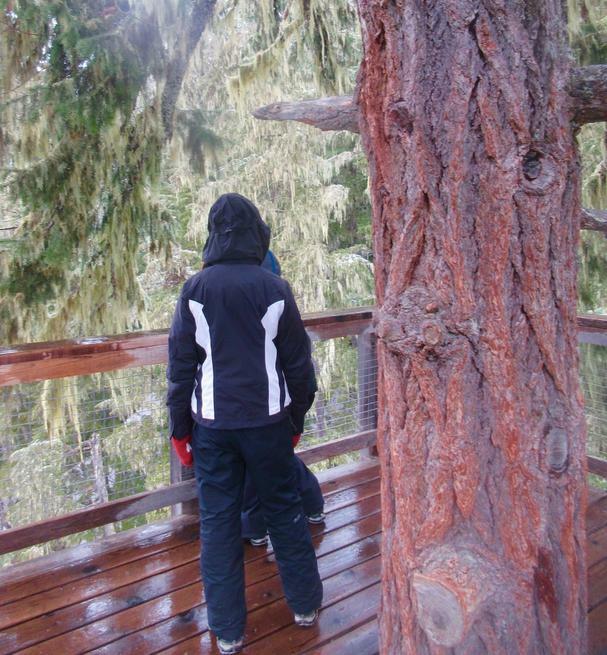 It is the worlds’ largest temperate rain forest. One of the most interesting things we heard is that many of the trees are 400 years old and the oldest one in the area is 1200 years old. You might ask how did we hear about that? It was not from the trees but from a tree ring study. By the way, trees DO TALK! At least to each other. According to many scientific studies, trees use a network of soil fungi to communicate their needs to neighboring plants so they can share nutrients. You should check out this video. Many of the trees are swathed in light green lichen that drape from branches, adding to the beautiful and mystic quality of the scene. It is usually found in a forest away from poor air quality found in urban areas. The air was indeed fresh here! By this time, my very relaxed wife had arrived at the Audain Art Museum back in the Village. This relatively new (opened in 2016) museum is home to an extensive display of British Columbia art from the late 18th century to the present. The highlights are the impressive displays of 19th and 20th century First Nation masks, along with works by celebrated Canadian artists such as Emily Carr and E.J. Hughes. A wonderful contrast to the historic art of the First Nations, is the amazing collection of internationally renowned photo-conceptualists Jeff Wall and Stan Douglas. Her favorite? The Dance Screen – a contemporary carving by James Hart. Constructed of red cedar, abalone, mica, acrylic, wire and yew wood, this huge installation is incredible. And it is huge – 15 ft x 10 ft (4.5 meters x 3 meters) it takes up most of a wall. My wife reported that she could have spent the entire day just gazing at the Dance Screen and still not have seen all of its intricate details. Fresh air, spa treatment and an afternoon of enjoying art happily prepared us for dinner, and the Aura at Nita Lake Lodge was the answer. We were excited to see “The Spring Wine & Dine” package. 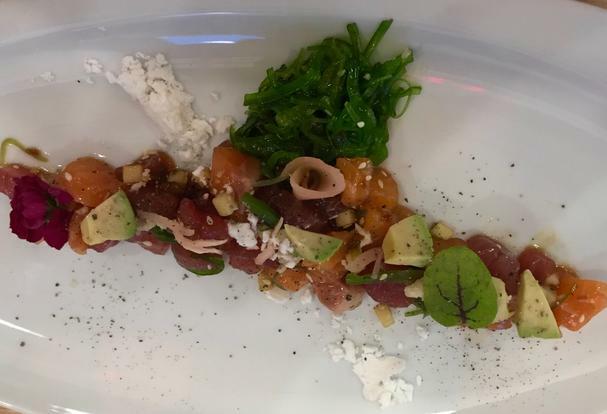 This is a three-course dinner with wine pairing, starting with Yellow Fin Tuna and Kuterra Salmon, accompanied by pickled ginger. This was paired with the “Taste of BC” gold metal winning Pinot Grigio from Averill Creek located on Vancouver Inland, B.C. We enjoyed the Pinot’s light fruits and fresh taste. For those who are wondering - Pinot Gris and Pinot Grigio are made from the same grape, but are originally from different locations, and made in different styles. Pinot Gris originated in France and Pinot Grigio in Italy. It is the difference in style that distinguishes the taste. Pinot Gris is rich and sweet, with spicy fruits and Pinot Grigio is lighter with crisp citrus flavors. For the next pairing, we stayed with British Columbia wines from the warmer climate of the Southern Okanagan Valley where 30 C-90 F is very common in the summer. The Grilled AAA Angus Striploin Steak and the LaStella Fortissimo were a quintessential pairing. The word fortissimo in music means to play “very loud.” And the deliciousness of this wine certainly made itself heard! It is a blend of Merlot, Sangiovese, Cabernet Sauvignon and Cabernet Franc, with fantastic layers of fruit and savory flavors. The complex flavor profile was the perfect complement to the tender steak. We also tasted the Linguini with Braised Short Ribs, paired with Mezzacorona Pinot Noir, from Italy. The tender ribs were served with mushrooms and pine nuts – and were delightful. The last wine presented was the Late Harvest Riesling from Fort Berens Estate Winery located north of here. The vigorous debate was: what would be the best second partner of this pairing? So, once again we used the "divide and conquer: move. 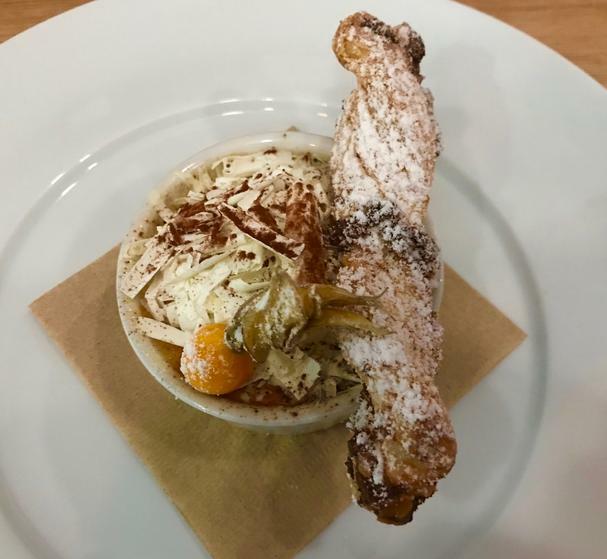 I greatly enjoyed the Vanilla Crème Brûlée, served with almond puff pastry sticks and declared it the winner. However, my wife insisted that the Sticky Toffee Pudding, with maple cashew cream and marinated berries, was a better partner. However, the Late Harvest Riesling was the star with both desserts. Its flavor notes of caramelized apples, butter, and soft honey, with a delightfully long finish, make it an amazing dessert wine. During our tour of the lodge, my wife was wondering if she could fit in two spa experiences in one day. The award-winning Nita Lake Spa has been named as one of the top 20 spas in the world by Conde Nast Traveler in 2016 and has also been awarded Top Destination Spa of 2017 by Spa Inc Magazine in 2017. The spa features massage therapy, body scrubs, facial therapy, waxing, and nail care – all in a beautiful and soothing ambiance. Nita Lake spa is proud to be certified as a Sustainable Spa by Green Circle Salons. They are committed to being stewards of clean air, water, and soil by diverting 95% of their waste water from landfills and waterways and using all natural products. The most difficult part of our visit is getting ready to head home. However, an enjoyable part of that is making a list of things to do when we return. First on the list is the Sip and Savour Winemakers Dinner this year hosted by Nita Lake Lodge. We could plan on staying at the lodge, Whistler’s only lake-side lodge, overlooking the lake and the mountains. 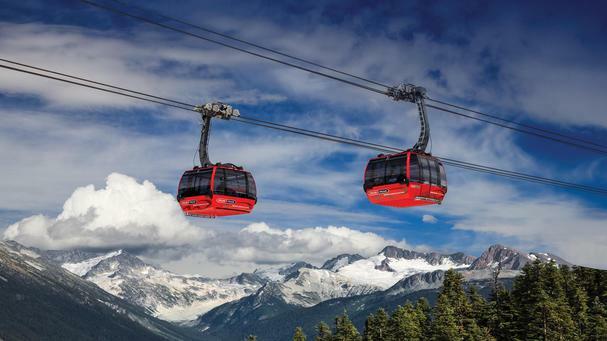 When visiting Whistler, a must-do is the Peak 2 Peak Gondola between Whistler and Blackcomb Mountains with breathtaking scenery. If you want more breathtaking views with a musical theme, try the Musical Bumps Trail. You can hike past the peaks of Flute, Oboe, and Piccolo and if you listen to the wind blow, wonderful sounds and sights will follow. I did this memorable hike several years and plan to return soon. 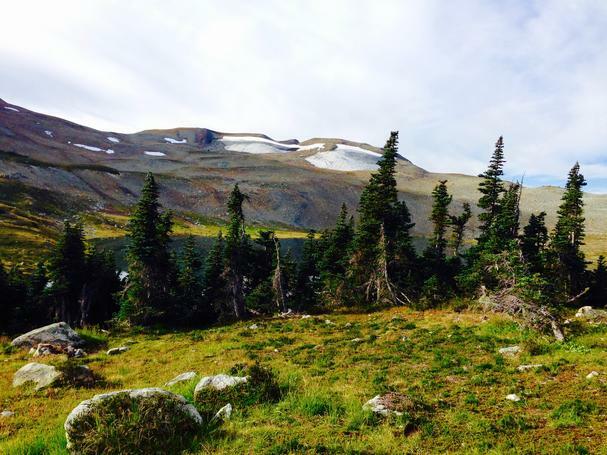 You can check out the many other summer hiking trails here. We look forward to our return and just need to pick the best season. Many claim the best season is winter-spring-summer-fall! Disclosure: Please note that food and lodging were complimentary.